Just like another French duo, The Blaze choose to be as anonymous as you can. However, while Daft Punk nowadays provide the soundtrack to glamorous lounges and dance floors, this pair possess a darker tone. It’s not just sonic, either – the scene is suburb instead of downtown, it’s weed instead of coke, striped tracksuits, and bromance instead of glamorous girlfriends. It’s easy to believe the guys in the ‘Virile’ video are behind this suggestive, sentimental, slowly pulsating house music, but that’s wrong: they’re actors. The guys in The Blaze directed the video, which was released in early 2016 and spread by word of mouth and from feed to feed to become a huge viral underground hit, which was named ’Best Alternative Video’ at the UK Video Music Awards. If ‘Virile’ is brotherly outsider-escapism, the follow-up is a journey back to their roots. 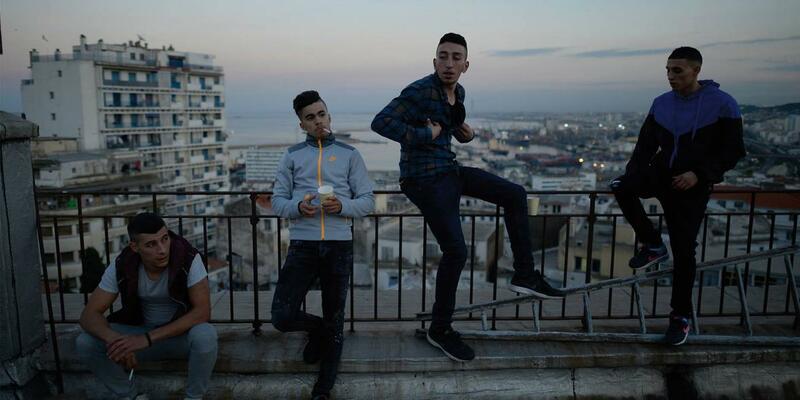 Their new track, ‘Territory’, which is also accompanied by a self-directed video – almost a mini film – follows the main character home to Algeria where he is reunited with family and friends. The Blaze’s recently released EP is based on these singles, plus two additional tracks and some interludes. The Next step for the pair will be their first ever live shows, which are scheduled for this summer. Something tells me that processed-vocals, sad storyteller house will be accompanied by dancers and visually captivating projections, because The Blaze is all about the multimedia experience.